Are you in "Awwwwwwww" overload yet? These two little guys were both orphaned last month and adopted by the Izaki City Zoo in Fukuchiyama. They've since become fast friends. Awwwwwwwwwwwwwwwwwwwwwwwwwww! 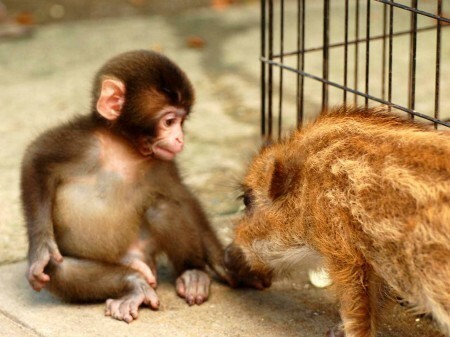 Fukuchiyama 猪崎 City Zoo (Principal Kuni Takashi Nihonmatsu) is the son of Uri bow baby monkeys and wild boar, and has fostered a strange friendship. Two cats each other around the first month of life, protected circumstances are overlapping in nature away from their parents. And out of the gauge, harmonious snuck show up. The monkey's death parents, Beau was rescued but Uri was in a rut in the dog. The zoo has about a month ago with two dogs. There is both love and respect that I just hit it off close to the test in about a week ago. Nihonmatsu Principal said, "but naturally wary of each other parents, two dogs that I think might be the parent keeper. Meantime monkeys, wild boar, I want to watch a warm human love triangle" and said.